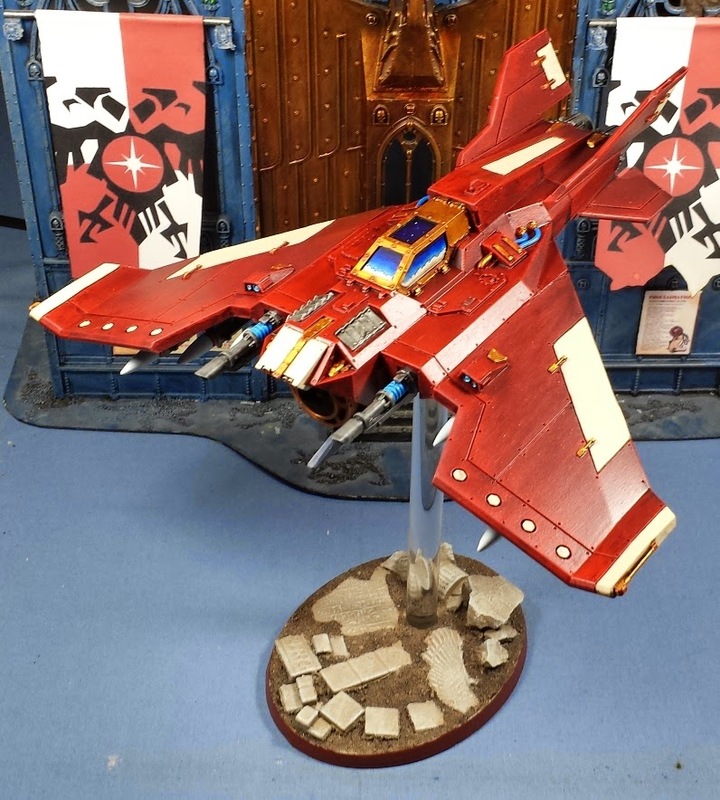 Been cranking along on the bolter and chainsword painting challenge and recently finished the paint job on the Lightning fighter that will accompany the Prospero Spireguard contingent of the Thousand Sons army. I have to say that while I really dug the old Lightning (and am bummed that FW has apparently discontinued it), I absolutely love this model even more! It definitely is more stylistically related to the Thunderbolt, and has a much more menacing look overall. I tried to mimic the blended red that I did on the Crimson Hunter from a while back - it ended up being a little more streaky than I hoped, but it sort of gives the model a sense of motion. 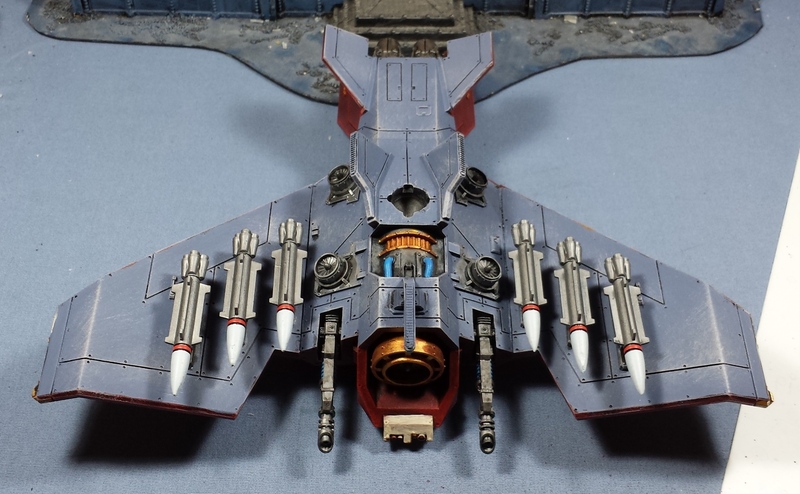 I went with a blue/grey underside, to help the plane blend into the sky from the ground, and absolutely not because I royally screwed up the blend on the bottom when I was originally painting it red. No sir! The pilot, while cool, didn't really fit in with the rest of the infantry style so I tried my hand at the artificial horizon look. In the heresy rules, the lightning has the option of taking either a regular pilot or a battle servitor so the opaque canopy lets me choose whichever one strikes my fancy at the time. Still have to work out the waterslide transfers and freehand work, but at this point it's painted, sealed and ready to receive! Wonderful looking fighter! It is a fantastic model; I too like its similarities to the thunderbolt. 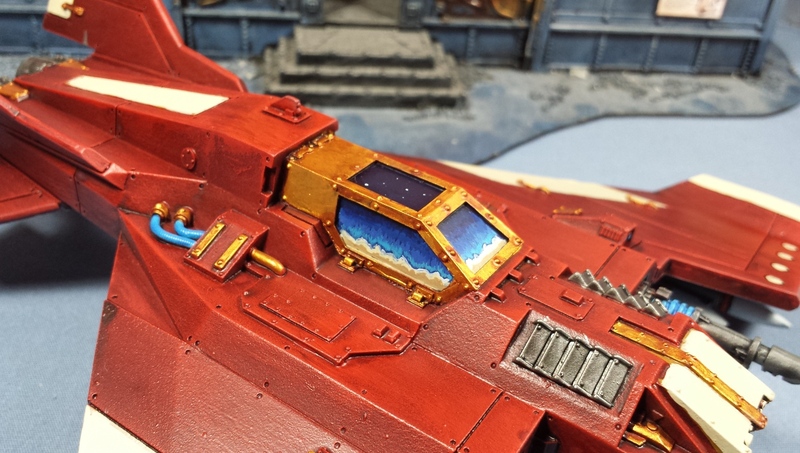 The paint job is very striking, and should make an excellent addition to your Thousand Sons! Great paint job! I love the model too, how does it fair on the battlefield? The stats look flimsy, especially with so many Kheres Mortis Contemptors about. Love the colors on this, great work buddy! God Dammit! In the months it has taken me to complete 11 scouts for the NOCF you have basically completed a whole army with allied awesomeness. Awesome! YEEESSSSS!!! 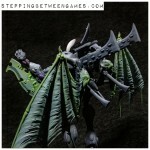 Looks Amazing, I see you went for the grey underside as well I like that. I really like the technique you used to paint the cockpit windows. Looks like a skyline for sure. I dig the details on the canopy. This turned out awesome, nice work. Great work mate. Colors fit this model like a treat. @Eric Wier: Thanks very much, man! @Zab: Hah! The difference is, your models looks freakin' EPIC, while mine are merely tabletop quality. I aspire to get the results you do, your work is a constant inspiration! @CJ Kilbride: I really appreciate it! @Manus: Cheers mate! I'm approaching the end of the models I have on hand, then it's back to the Ad-Mech for me! I really appreciate all the kind words, everyone! Awesome looking fighter! The reds turned out beautifully. The grey underside was a great decision too, providing a nice contrast. 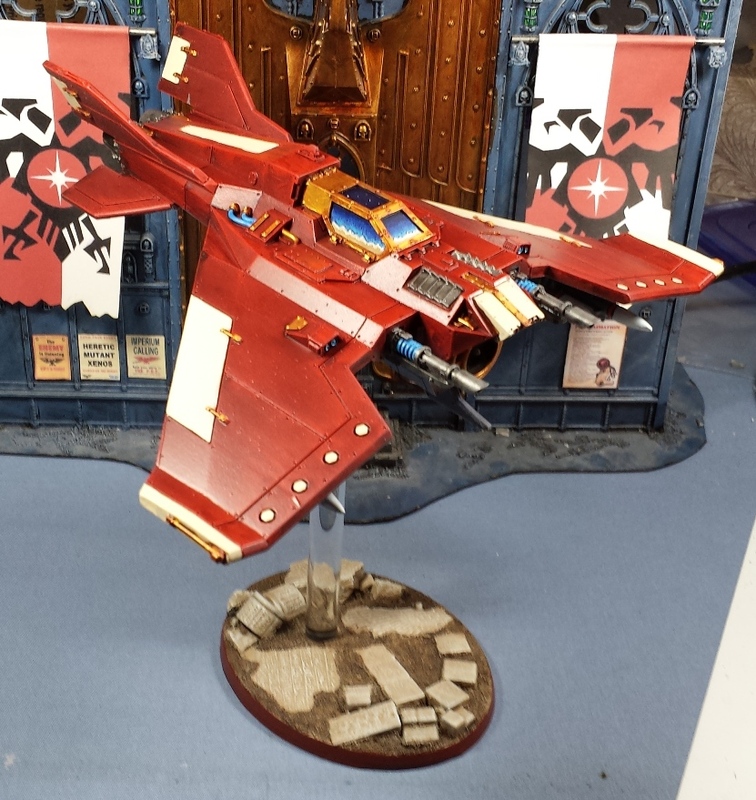 @Raymond Tan: I've considered it, but the hassle of the compressor and spray booth, and the cleaning hassle has so far dissuaded me. I do love the finish that an airbrush gives though! @Adam Wier: I appreciate it - thanks very much! First time I've looked at this model and liked it. Super cool.